Mix venison with Cajun spice and garlic, add a little oil to moisten. Cook quickly on a hot plate, turning to avoid sticking. Cook for approx 20-30 seconds. Add sliced vegetables, salt and pepper, Warm vegetables through, but keep crisp, then rest venison to one side. Heat BBQ sauce, warm tortillas on the hotplate. 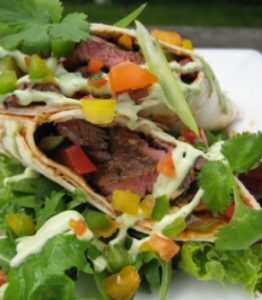 Spread BBQ sauce on each tortilla, place a heaped spoonful of the venison on each tortilla and roll tightly. Mix avocado, sour cream, finely chopped cilantro, lime juice and salt and pepper in a blender. Blend until smooth. Can be prepared ahead of time and will last for several days in the fridge. Cut each enchilada on the bias, lay on a bed of fresh leafy green salad. Drizzle with the cilantro cream and garnish with diced capsicum and cilantro leaf.